Wearing, Enjoying, and Sewing Vintage One Piece at a Time . . . Finally up here is my second German Photo Album. 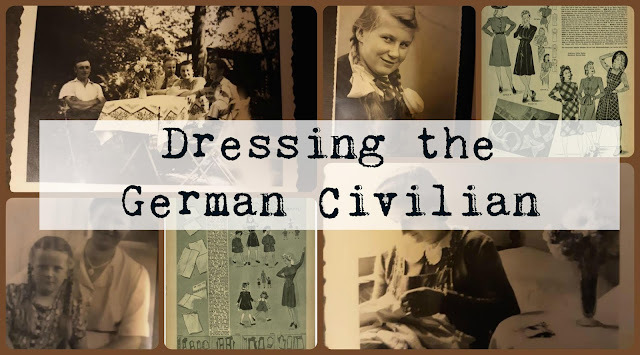 If you missed my first one you can catch that one here (its worth taking a look at if you are interested in German civilian attire). This time I have another album, my second one which is a larger one and covers a larger time span as well as more kinds of folks from moms to dads to aunts and uncles to children old and young. There are also a couple of uniformed men in here too. The years of the photographs range from the 30s (based on the clothing) to the war years but I'm note sure how late into the 40s they are going. Since this is such a BIG album I am breaking it up into parts so that you can really study and appreciate each image. 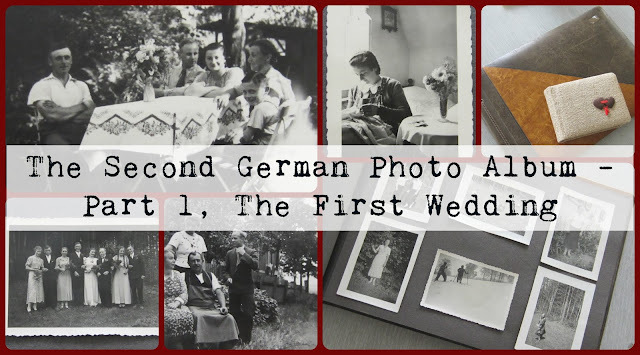 As you have probably guessed by the title, there are two weddings in this album and here is the first one. To start, the album opens up with a wedding that, based on the clothing in the images, took place in the mid 30s I think. The skirts on the dresses are a longer hem going to about mid calf ( by the late 30s and 40s these hems would have risen a but getting closer to the knees). These images are really lovely and they give an idea of what an average family would have worn for such a formal event Here we are seeing people of all ages and stages of life all enjoying a very happy occasion. Doesn't the Bride look lovely? Here too note the bride's maids dresses, the attire of the Groom and his Grooms Men and all the wedding goers. I think the attire of the children is really sweet as well. There is so much to study in these images and I think I'm going to just let them speak for themselves here. Enjoy! Ohhh! this is just beautiful! It's so sweet too, and it's worth remembering that this looks prewar too, there is a second wedding that is in the 40s. I can only imagine what became of these lovely people. Look! 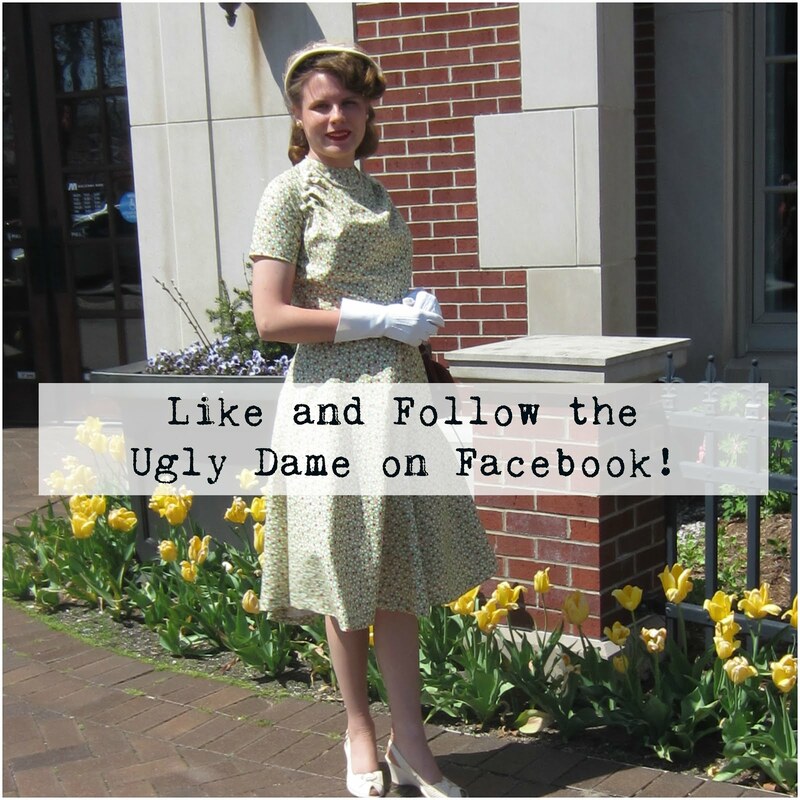 I'm on Facebook Too! Cozy and chic! My review of Ye Mak Sweater and an exclusive discount for YOU!